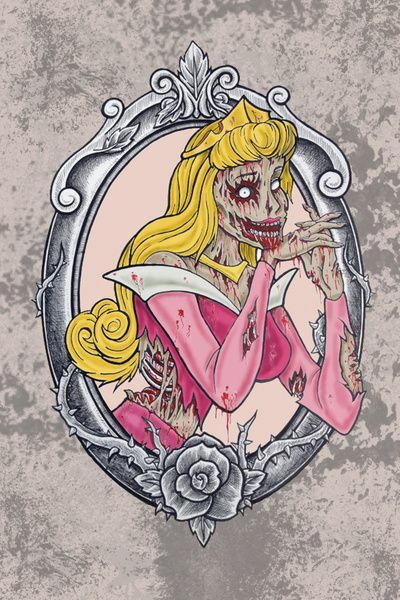 The beautiful, kindhearted and undead princess Snow Red charms and eats every creature in the kingdom except one - her jealous walker stepmother, the Queen. 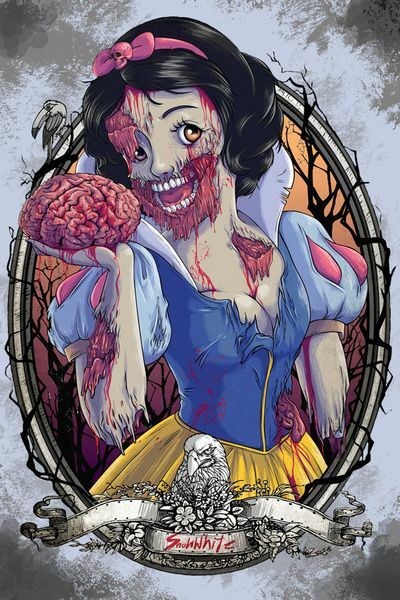 When the Magic cracked Mirror proclaims Snow Red the fairest and most undead one of all, she must flee and limp into the forest, where she befriends the lovable seven walkers - Doc Blood, Sneezy Blood, Grumpy Decapitated Head, Happy Biter, Bashful Eater, Sleepy Moaner, and Dopey Limper. But when the Queen tricks Snow Red with an enchanted poisoned apple, only the magic of true love's bite can save her. In a far away, long ago kingdom, Singerella is living happily with her mother and father until her mother dies and turns them all. Singerella's father remarries a cold, cruel and undead woman who has two Walker daughters, Drizeltheblood and Anastimpy. When the father gets killed as a walker, Singerella's wicked Walker stepmother turns her into a virtual pet in her own house. Meanwhile, across town in the castle, the Human King determines that his son the living Prince should find a suitable bride and provide him with a required number of grandchildren. So the King invites every eligible maiden and undead maiden in the kingdom to a fancy dress ball, where his son will be able to choose his bride living or undead. Singerella has no suitable party dress for a ball that isn’t covered in blood, but her friends the rats, led by Jabites and Guts, and the birds lend a hand in making her one, a dress the evil walker stepsisters immediately tear apart on the evening of the ball along with her arm. 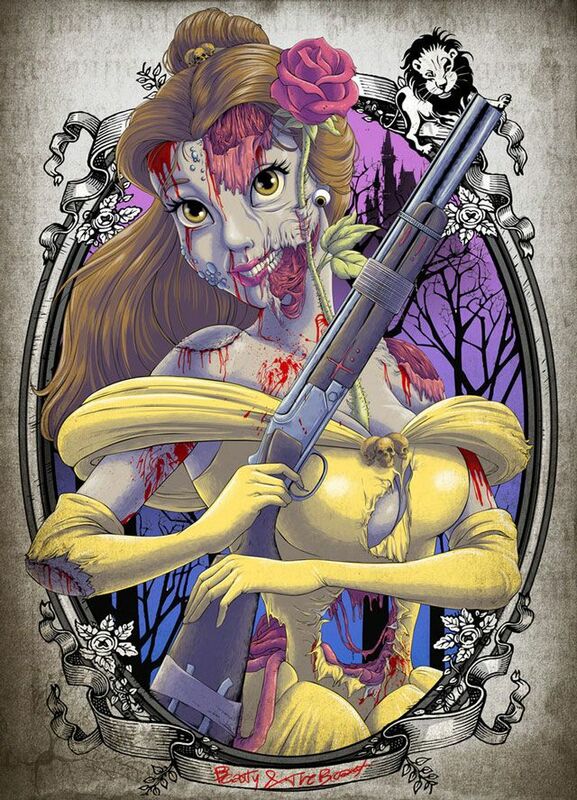 At this point, enter the Fairy Deadmother, the rotten pumpkin carriage, the royal ball, the stroke of midnight, the glass shard slipper, and the rest, as they say, is fairy tale history. After a beautiful princess, Aurawr, is born into royalty everyone gathers to exchange gifts. Everything is perfectly fine until an unwanted guest appears, Deadeficent. Deadeficent casts a spell on the young princess and announces that she is now undead and will officially die by pricking her brain on the spindle of a spinning wheel she will fall on, on the evening of her 16th undead birthday. Fortunately, one of the good living fairies, Merrywithher, changes the spell so Aurawr will fall asleep like the dead, and that the only way to wake her up were the blood from her true love. Finally the day comes. Will she be left to sleep forever into an undead sleep? Alice is a daydreaming young survivor girl. She finds learning poems and listening to literature boring as all hell. 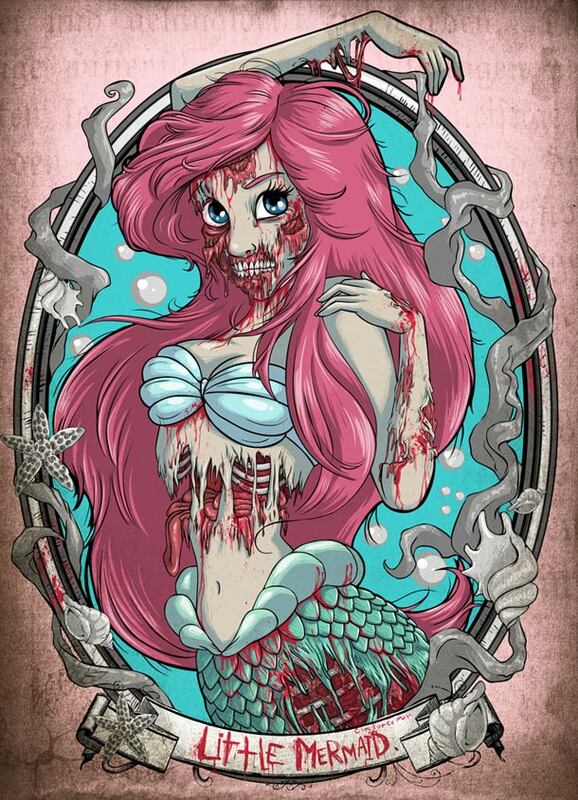 She prefers stories with pictures of gore and to live inside her imagination filled with blood. One day, while enduring just such a boring poetry reading, she spots a large white undead rabbit...dressed in a ripped jacket and carrying a large broken watch. He scurries off, saying he's late, for a very important date of undead. She follows him through the dead forest. He then disappears down a rabbit blood hole. 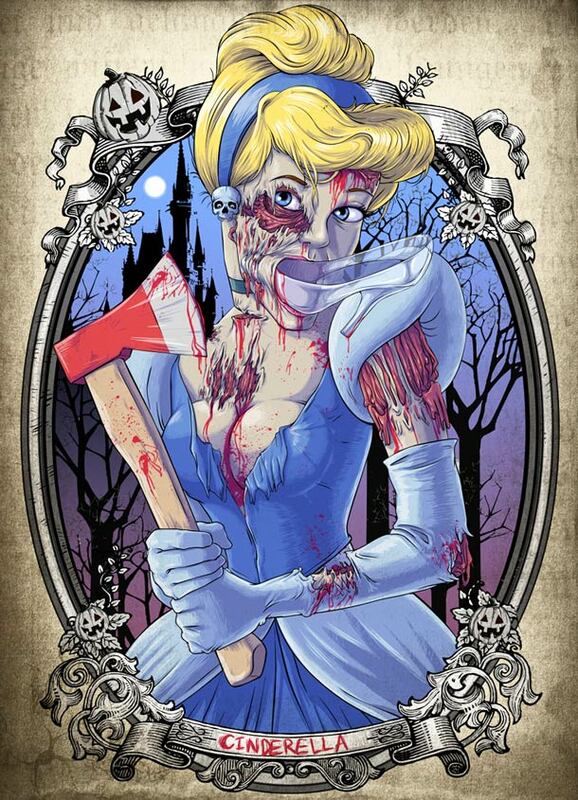 Alice follows, leading her to all manner of gorey discoveries, undead characters and Blood covered adventures. In Disney's beguiling animated romp, rebellious 16-year-old Walker Arsenal is fascinated with life on land and not in the well she is floating in. On one of her visits to the surface after the well filled up, which are forbidden by her controlling owner of the walker, Sheriff Rick, she falls for a living boy. Determined to be with her new love, Arsenal makes a dangerous deal with the sea walker Urkmychain to become living for three days. But when plans go awry for the star-crossed lovers, the Sheriff must make the ultimate sacrifice for his pet walker. 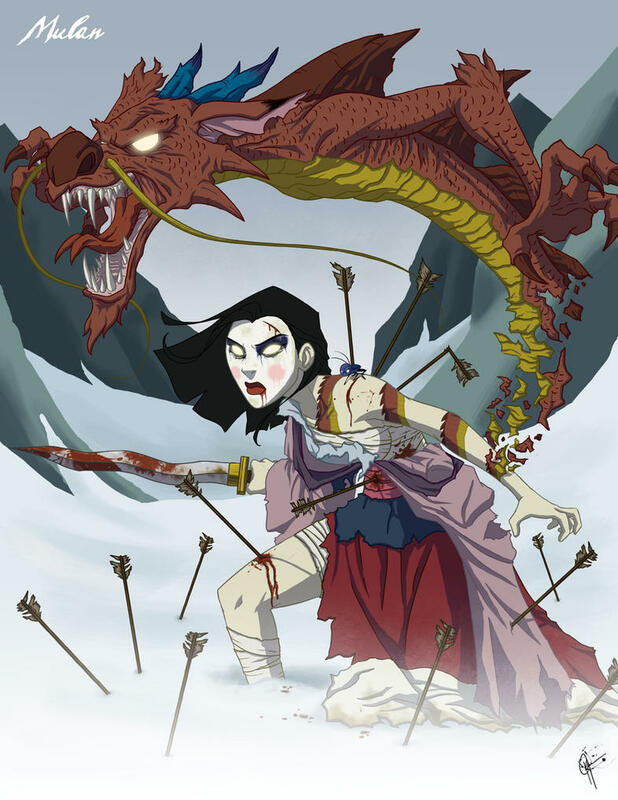 This retelling of the old Chinese folktale is about the story of a young Chinese undead maiden who learns that her weakened and lame walker father is to be called up into the army of the undead in order to fight the invading Humans. Knowing that he would never “survive” the rigours of war in his state of decay, she decides to disguise herself and join in his place. Unknown to her, her undead ancestors are aware of this and to prevent it, they order a tiny disgraced bloody dragon, Mushy to join her in order to force her to abandon her plan of joining the undead. He agrees, but when he meets Mutan, he learns that she cannot be dissuaded and so decides to help her in the perilous times ahead in the bloody world. Having lived a life in selfishness and hunger, a young prince is cursed by a mysterious disease to having the appearance of a monstrous and mutated undead beast. His only hope is to learn to love a young human woman and earn her love in return in order to redeem himself and become living again. Years later, his chance shows itself when a young survivor maiden named Bloode offers to take her ill father's place as his prisoner in his broken and rotten castle. With help from the castle's enchanted walker pet staff, Bloode learns to appreciate her captor and immediately falls in love with him and his decaying ways. Back in the village however, an unscrupulous hunter of walkers has his own plans for Bloode.